It was a given The LEGO Movie would eventually get a sequel, but it's kind of crazy it took five years for that sequel to actually happen. That said, Warner Bros. has certainly expanded the LEGO brand by giving LEGO Batman his own feature as well as delivering their only misstep thus far, The LEGO Ninjago Movie. And while there was some trepidation going into this delayed, but inevitable sequel given original directors Phil Lord and Chris Miller were no longer at the helm there was some hope given it was still their minds that conjured up the screenplay. Thankfully, Trolls director Mike Mitchell was brought on board and has successfully converted Lord and Miller's screenplay into a sequel that keeps things in step with if not necessarily surpassing the original. Of course, given the precedent set for the original and what it turned out to be versus the raised bar for the sequel and what it has turned out to be-that's a solid accomplishment and a resounding endorsement. That is to say, upon initially hearing there was going to be a movie based solely around the LEGO brand and the toys and properties they owned it seemed obvious the eventual movie would turn out to be little more than a cash grab; nothing more than one big commercial, if you will. To expect this was ultimately foolish given the creative team behind it as Lord and Miller delivered a witty, colorful, and (per usual) meta piece of cinema that took some unexpected themes and conveyed them in a manner that allowed the children to enjoy the toys coming to life while the adults latched onto those ever fleeting moments of innocence that come with raising children and attaching certain memories to their playthings. 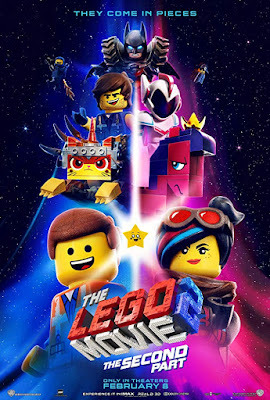 The LEGO Movie intentionally evaded everything audiences expected it to be, disrupting the status quo and turning heads, but how was something so inventive and appropriately rowdy supposed to then follow itself up with something as conventional as a sequel? Especially given the abstract qualities of the first and having to continue the same narrative while holding tight to the themes the first film so perfectly encapsulated? It turns out, the trick is to lean into such things even further; deliver the same goods in a different package and through different techniques. And though The LEGO Movie 2: The Second Part might feel redundant in certain ideas, the ideas it's pedaling never don't need to be heard...especially when they're this creatively catchy. Wyldstyle (Elizabeth Banks) and Emmett (Chris Pratt) are back for another adventure in The LEGO Movie 2: The Second Part. Speaking of the screenplay, things have only gotten worse after the events of the first film with Chris Pratt's Emmett being in denial about the ramifications of everything that has recently occurred. Prompting new conflict though, is not the return of President Business, but the arrival of LEGO DUPLO® invaders from outer space, wrecking everything faster than they can rebuild. In terms of how to continue to expand this universe while using the stable of toys they have to work with to their greatest advantage, this is a solid idea, but it is what Lord and Miller do with the already established framing device that allows for this continuation of the narrative to once again yield not only fun and entertaining results, but emotionally moving ones as well. In the film, Emmett and Wyldstyle AKA Lucy (Elizabeth Banks) are dealing with the fallout of this invasion that has been going on for some five years now as Emmett continues to be cheery and optimistic while Lucy prefers to be more brooding and "mature". Bricksburg has morphed into what has been re-branded as "Apocalypseburg" with the fact Emmett is unable to see that things won't be going back to being awesome being the crux of the issues that begin to show cracks in the relationship between him and Lucy. Things go from bad to worse when General Mayhem (Brooklyn Nine-Nine's Stephanie Beatriz) shows up with the intent of bringing back a suitor for Queen Watevra Wa'Nabi (Tiffany Haddish) of the Systar System to wed so as to accomplish what is presumed to be a nefarious plot. Thanks to the naiveté and general gullibility of Emmett though, Mayhem is able to get away with Lucy, Batman (Will Arnett), Benny the Space Man (Charlie Day) MetalBeard (Nick Offerman), and Unikitty (Alison Brie) leaving Emmett to have to own up to his mistake and grow out of his perceived lack of awareness and become a grittier, cooler, darker version of himself that isn't afraid to embrace the cynical side of life. Lucky for Emmett, on his venture out of Apocalypseburg and into the Systar System he stumbles across Rex Dangervest (also Pratt, but sounding suspiciously like Chris Pratt doing a Kurt Russell impression) who is a fearless and brave LEGO action figure that is not only a cool space pilot, but an archeologist, cowboy, and raptor trainer (wink, wink). Upon arriving in the Systar System though, Emmett learns that much more is at stake than just the safety of his friends as something called the "Momageddon" looms near. In regards to the aforementioned framing device, Lord and Miller use this device to once again traverse the film's emotional territory. What differs slightly this time around though, is the emotional terrain covered as the film dissects the transition from innocence to experience and the lack of fun that seemingly has to come with growing-up. In essence, Lord and Miller are encouraging the idea of both maintaining ones sense of youth and wonder while suggesting the bigger issue is not remaining youthfully optimistic, but closing off that part of ourselves that is our youth and wonder and not sharing it with those around you-a youth and wonder that is derived from playing with LEGOs, mind you. If you're a keen adult viewer in the slightest it's not difficult to pick up on the clues being laid out by the character names and environments that suggest how each might fit into this world designed by the kids playing with them. The LEGO Movie 2 is somewhat spoofing the idea that to mature automatically means one has to be more serious and less fun-which falls perfectly in line for the sequel to also spoof this idea as it pertains to sequels and the second chapter always being a little darker and a little grittier-with all of this culminating in the revelation that changing for the better is in fact more beneficial than changing for the tougher. The film isn't discounting maturity, mind you, but is advocating for allowing one's self to look at things from a different perspective as even inherently bad situations might become more bearable if approached with more optimism and joy rather than more bad. The message is simple: spread kindness, not hate. Open your heart, don't harden it. Know that while everything might not be awesome all of the time that this doesn't relegate everything to being hopeless either. It's in the execution of these simple, but effective reminders as expressed through the relationship of Finn (Jadon Sand) and younger sister Bianca (The Florida Project's Brooklynn Prince) that the film really hammers home the fact that lightning is kind of striking twice and giving way for a movie about toy bricks to resonate deeply. General Mayhem (Stephanie Beatriz) offers a new foe for our heroes in the sequel. It might seem that it's now impossible for any movie made about toys to find itself not discussing anything other than the eventual loss of innocence by those who find the most joy in them, but as the broad strokes of the film boil down to learning to play together, constructively, it also seems Lord and Miller delve into a whole new realm of meta-commentary. As the toys themselves reflect the characteristics of the age of the kids who are playing with them the themes of the story become questionable as to what exactly Lord and Miller are chasing exactly. Given the number of tropes and pop culture references spoofed here, it would seem the writers were keen on discussing how a culture consumed by intimidating levels of content have culminated with new generation's imaginations having also been consumed by the conventions of these movies and TV shows to the point their minds no longer know how to do anything other than imitate as much. In going this meta one wonders whether or not Lord and Miller thought this analogy of sorts through or if they simply could walk it off by tying it back to the themes of growing past certain things while embracing certain aspects of other things-whether it be our childhoods or our movie and TV clichés-so as to continually strive for the best, but keep our expectations in check. It's difficult to say given the conclusion of the film only seems to restate the "open your heart, don't harden it" thesis rather than acknowledging much in the way of how they might suggest we begin to change or at least evolve these conventions they've become so adept at lampooning. It's nice to acknowledge all these familiarities and poke fun at them, but it will be interesting to see how-as these tropes do begin to adjust and evolve-how Lord and Miller do so with them. Coming back out of that wormhole though, and taking The LEGO Movie 2 for what it's worth based on face value alone is to reiterate that it is a ton of fun that has no right being as good or ambitious as it ends up being. Yes, the themes and meta-commentaries are great and add layers upon layers of ideas for young viewers to dig through and better comprehend as they grow-up (hopefully) re-watching these films, but beyond that they are fulfilling on a basic level as well; engineered for any engagement level. The Lonely Island guys are back with Robyn for a ditty just as catchy and maybe twice as funny as "Everything is Awesome" (stay through the credits, seriously...not for what comes after them, but for the credits themselves) while the likes of Haddish, Beck, and T-Pain perform original songs within the context of the film ("Oh no, are we in a musical?") each of which do well to stick in your head, progress the story, and be genuinely funny. Further, Mark Mothersbaugh's score is as much a play on the orchestral scores of big tentpole, franchise films as the script is on the previously discussed conventions of these genres. The animation is stunning (as always, see it on an IMAX or Liemax screen if playing on one near you) as the detail of the scratches and scuff marks on each of the pieces in play here is unbelievably life-like and really stands out in this format. And finally, if for nothing else, see the film because it truly is genuinely funny and maybe more importantly-consistently funny. For someone who sees at least one new release in theaters a week it's been a fair amount of time since there was this much fun to be had at the movies (coincidentally, maybe Spider-Verse?). The LEGO Movie 2 doesn't necessarily surpass the precedent set by the first, but it does keep up with and stay in line with that unbelievable precedent giving audiences both a reality check as well as a dose of reassurance.